Based on my 2+ years experience with smoothies, I can definitely say that drinking green smoothies is the quickest, easiest way to obtain incredible health results without a lot of fuss or effort. Simply by adding one green smoothie to your diet every day will likely start to bring about amazing positive change in your body. When the body gets the foods it needs, it can heal itself. Green Smoothies are fast and extremely easy to make. 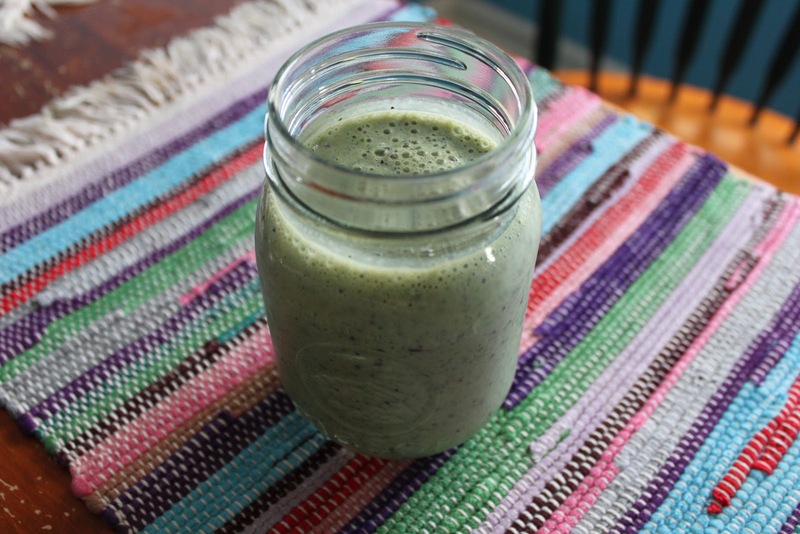 No matter what your schedule is, you can manage making a Green Smoothie. From start to finish, it takes less than 5 minutes, and that includes cleaning up! And – if you are overweight – you will likely start losing weight really quickly too, because you will be eating less of the fattening foods that you normally crave. I’ve been drinking them for years, and I honestly cannot remember feeling so vibrant! 1. Green smoothies make healthy nutrition effortless. Let’s face it: most of us are very busy these days, and healthy nutrition is one more item on the already too long to-do list (often falling to the bottom replaced by more urgent tasks). No wonder that eating enough of green leafy vegetables is often a problem with many people, especially children. Fortunately regular consumption of green smoothies forms a good habit of eating greens. After a few of weeks of drinking green smoothies, you may find yourself craving and enjoying greens. You will become addicted to them, which is a good thing! 2. Green smoothies are incredibly nutritious!Because green smoothies incorporate fresh fruits and veggies, they are usually high in vitamins A, C, K, E as well as calcium, fiber, and protein. The darker, leafy greens also provide a variety of important phytonutrients like beta-carotene and lutein, which protect our cells from damage. Some even contain small amounts of Omega-3 fats that are important to brain health and functions. Most experts agree that we need to eat fresh fruits and veggies every day. The USDA recommends that we eat at least 3 cups of the leafy green variety every week. 3. Green smoothies are easy to digest. When blended well, all the valuable nutrients in these fruits and veggies become homogenized, or divided into such small particles that it becomes easy for the body to assimilate these nutrients. The green smoothies literally start to get absorbed in your mouth! What people don’t typically know is that the cell walls of many leafy greens are incredibly durable and hard for the body to break apart. Chewing really well helps to “break” the cell walls and allow access to the nutrition inside, but very few people chew their food that well, especially children. This is just another reason that green smoothies are so wonderful. Using a blender breaks these cell walls apart and makes these nutrient easily available. The blender “chews” the greens for you! 4. Green smoothies are easy to make, and quick to clean up after. No cooking or washing pots and pans required! It’s also much easier than juicing–even the most health conscious people do not consume enough green juices on a regular basis because it takes too long to prepare them and clean the equipment after juicing. I used to do a lot of juicing in the past and I still do it, but let’s face it – it is quite time consuming and really messy. My problem is over since I started making green smoothies. Making smoothies is a super easy way to eat lots of greens, and a great alternative to juicing. 5. Green smoothies belong to the most palatable dishes for people of all ages. With a ratio of fruits to veggies as 60:40 the fruit taste dominates the flavor, yet at the same time the green vegetables balance out the sweetness of the fruit, adding nice zest to it. Green smoothies are simply the best tasting dishes for the majority of adults and children. 6. Green smoothies reduce cravings for sugar and other processed foods that are not good for you by flooding your body with nutrients. When you consume your greens in the form of green smoothies, you can greatly reduce the consumption of oils and salt in your diet (in the form of salad dressings and other foods you would normally eat). One reason we crave certain foods, is that these foods contain opiate-like chemicals that make you crave them. The primary addictive foods include sugar, chocolate, cheese and meat. The other reason is this: The diet that an average person consumes today is deficient in many essential nutrients. If your body does not get what it needs to function properly, it will demand you eat more and more food. Green smoothies will provide your body with the nutrients that it needs to function. 7. Green smoothies can help you lose weight by reducing those cravings that keep sabotaging your weight loss goals. 8. Green smoothies are perfect food for children of all ages, including babies of six or more months old when introducing new food to them after mother’s milk. 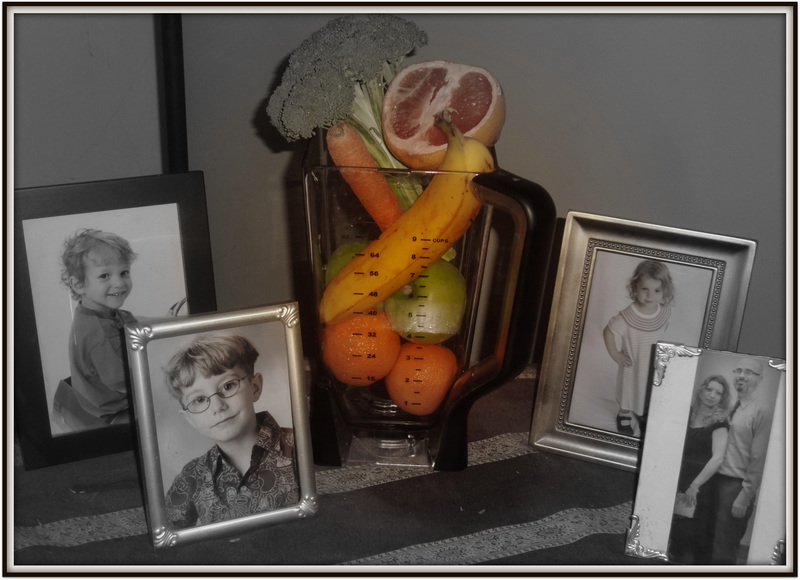 Kids love smoothies and most will never notice they are drinking their vegetables unless you tell them! If you can’t get your kids to eat spinach or kale in their dinner salad, you will be amazed to see them relishing these very same ingredients inside a fruit smoothie. Of course, you have to be careful and slowly introduce new ingredients to avoid food allergies. 9. Green smoothies, unlike juices, are a complete food because they retain all fiber. They provide a feeling satiety, and can be used to replace meals. 10. Green smoothies are loaded with fiber, which helps improve digestion and elimination. The fiber acts like a powerful broom that sweeps the colon of toxins and waste. In each smoothie you’ll be getting plenty of FIBER – so forget about those colon cleansing supplements! 11.Green smoothies allow you to easily use up leftovers, such as leftover fruit and greens in the same way as you might put your leftover vegetables in a soup or stew. 12. Green smoothies can help you achieve beautiful skin, bright eyes, shiny hair, and a more youthful appearance. There is no skin cream or hair conditioner available on the market today that can compare to the beautifying effects of a regular supply of green smoothies. You will also need less makeup, deodorants and soaps. 13. Green smoothies can help you achieve overall improved health, increased energy and clear thinking. In one drink you will be consuming more nutrients than you have in a week if you live on processed foods! 14. Green smoothies will help you save energy and money. You will eat out less (try green smoothies for lunch instead of fast food) and there will be little cleanup. You won’t need any (or take fewer) supplements. You’ll be clean and beautiful from the inside! You may be wondering if it’s actually possible to experience all these benefits! Actually, it is . I read testimonials all the time from people all over the world who have experienced the power of raw and living foods, and I noticed that the benefits I mentioned above are the ones almost everybody who tries this way of eating experiences! However, green smoothies habit goes well beyond adopting a few simple recipes for health and weight loss. Don’t let the simplicity of the recipes and ingredients fool you. You will see improvements in your life in many other areas, not just health and weight management. Adding just one green smoothie a day will affect other areas in your life too. You will cleanse and detoxify your body, and this will lead to trigger the desire to clear and cleanse your lifestyle, your relationships, your work. You are likely to experience the desire to drop unhealthy habits, open your heart more and improve your life in both large and small ways – including, perhaps, adopting a more wellness centered lifestyle. Look for *BLENDED* – a once a month post offering positive resources, tips, and sharing that promote healing from divorce, moving on, and creating healthy blended families and well…. families and relations in general. As a Health Coach, and a Mom raising a blended (step) family, I hear from lots of parents telling me they know how important it is to feed their kids healthy foods, but they’re just not sure how to do it. Despite my own background in health and wellness, I have had to go through some trial and error with my own kids – especially because we are a blended family, sharing joint custody, and the nutrition outlook (importance of) varies between the kids homes. I think as parents we all have good intentions of feeding our kids healthy, wholesome foods at every meal and snack. But the reality is that sometimes life gets in the way and it just doesn’t always happen. We need backup as parents……..and when I say backup I really mean resources. When it comes to nutrition and eating there are literally thousands of different places you can turn to on the internet to get resources about what to feed your kids, how to feed your kids, when to feed your kids what food and the list could go on and on. It is true that different things work for different kids, but I have found that the following tips have helped my own children to be good eaters. By far the best predictor of children’s eating behavior is the eating patterns of their parents. If you are a picky eater, then its less likely your kids are going to branch out and try different foods. Kids eat what they know, and they won’t ask for a special meal if they do not know it is an option. It all begins at the grocery store. Whatever you bring into your house is what your kids will eat. If there aren’t fruits and vegetables available to them at your house, then they definitely will not eat them! If they see you eating them and if healthy food is served at meals, they are much more likely to eat those foods. The Integrative Nutrition Plate is one of the best visual aids I have come across to teach kids about portion size, balance and variety. 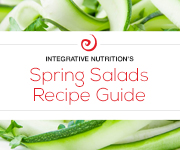 Unlike the food guide pyramid, the Integrative Nutrition Plate is a visual aid that you can use with your kids to learn from every time they eat. When I use this plate at meals, my kids definitely eat a more balanced meal and consume more fruits and vegetables than they would otherwise. Additionally, I prepare more balanced meals because I have to think about what I am going to put in each section. I truly believe that using this plate with your kids is one of the best ways to helping your kids be better eaters. I have found from my own personal experience, that consistently using this plate at meals has changed the way I think about food. It has definitely changed the way my kids think about food. 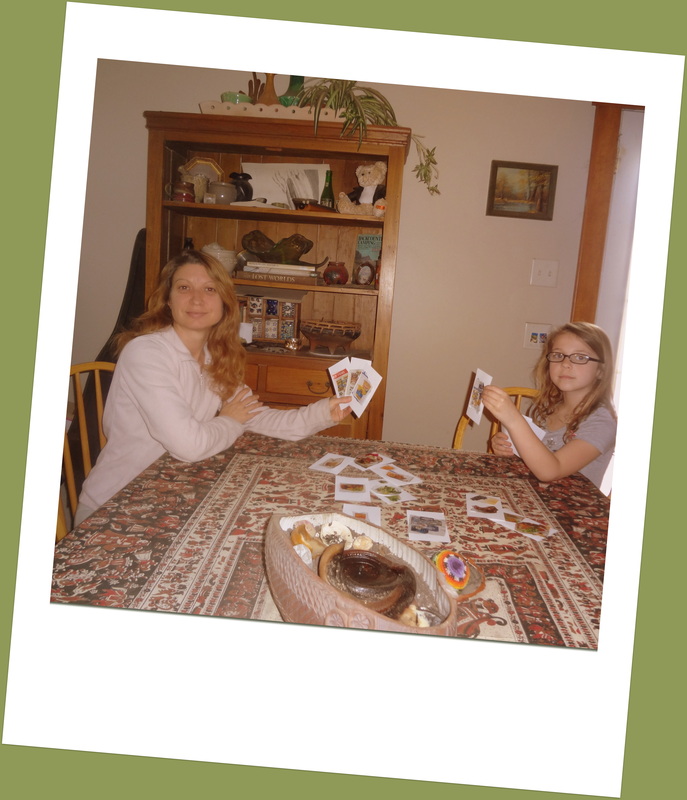 Kids love to play make believe and they also love games. We made a game we call “Food Or Crap” (pictured below). 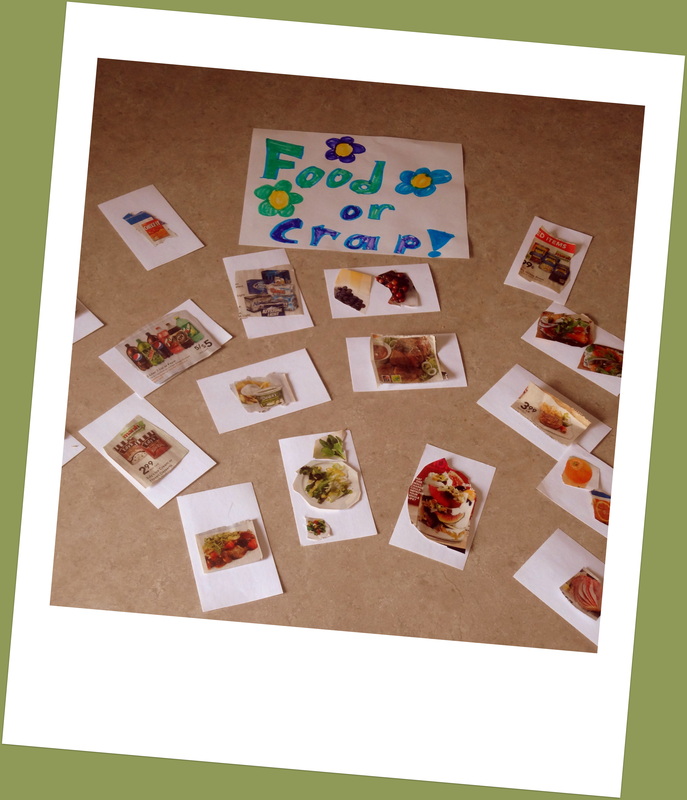 Using grocery store fliers and magazines, my kids cut out foods and categorized them as “Food” or “Crap” on notecards. We use the cards to play a guessing game is this REAL food that nourishes or is it FILLER food with little to no nutritional value? Green beans might not be super appealing to a child who was hoping for mac and cheese. Relating healthy food to fun things the child already loves and turning it into a game is a great way to get a young child to enjoy eating foods they might not normally want to eat. Children are more likely to eat the foods served at a meal if they help prepare it. I have found that letting your kids be involved from the beginning of food preparation – the grocery store – helps them to be excited to eat the food you are preparing. Having a garden teaches kids about where food comes from, and gives them a chance to eat fresh produce right from the backyard. Letting them clean carrots, snap beans, mix the dressing and set the table gives them a sense of pride and makes them more enthusiastic and cooperative at meal time. We all eat with our eyes, but children especially do this. Fruits and vegetables add a lot of color to a plate and you can expose them to more colors by adding more fruits and veggies. While adults tend to like flavors mingled together, children often prefer them separate. 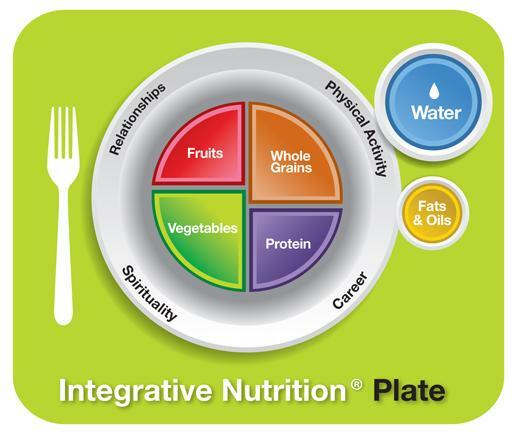 Using the Integrative Nutrition Plate helps not only to show you what foods you should have on your plate, but keeps food separate which kids love. In addition to the tips mentioned above, my partner and I make it a priority we share our meals together. Because we are a blended family we share custody (which means our combined children are in our home half the week and our ex’s take the other half) so the evenings and weekends that we have our kids is all about quality time. We all come together and connect around the kitchen table, sharing a healthy, home cooked meal and take turns expressing our daily gratitude .Nothing is more rewarding than hearing my 14 year old son, my 10 year old bonus-son, and my 7 year old bonus-daughter declare, “I’m grateful for the healthy food we have in front of us” followed by compliments and appreciation. Now that’s Buddha Belly satisfying! What are some ways you promote healthy eating habits with your kids? Nature-deficit disorder: a reduced awareness and diminished ability for adults and children to find meaning in the life around them, due to a reduced amount of interaction with the natural environment. 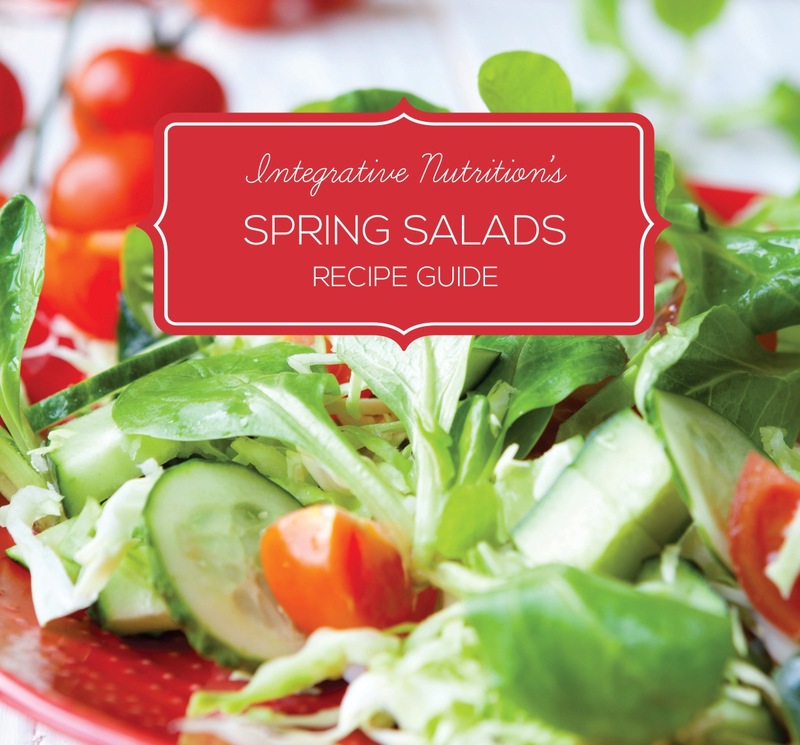 March 10, 2014 by Victoria Pardue Certified Integrative Health & Yoga Fit Instructor, posted in Primary Food: Relationships,Physical Activity,Career,Spirituality, To Your Health! I know you’ve heard it before, “Fresh air will do you good”? But it now also makes sense scientifically. A surge of studies strongly suggest evidence that we can be happier, healthier, and smarter if we weave more nature into our lives. Studies are proving a link between the outside and your insides, and that the best mind-body medicine is right beyond your front door. For millions of years, humans depended on nature for just about everything, including food, shelter, and the regulation of sleep cycles, says M. Sanjayan, Ph.D., lead scientist for The Nature Conservancy. “Nature guided us in a very direct way,” he says. “But in the past thousand years, that started shifting; in the past 50, it has really shifted. And that the sudden absence of nature from our lives could throw our well-being way off-kilter.” In fact, the modern way of living, complete with loads of sitting and indoor time, has given rise to poorer health. Other research suggests that rising rates of allergies and autoimmune disorders might be caused, in part, by less exposure to healthy bacteria found in nature. Still more science has linked reduced exposure to nature to higher risk for obesity, cancer, heart disease, anxiety, and depression. Basically, going outside has become an option. It’s not an option. It’s a non-negotiable. 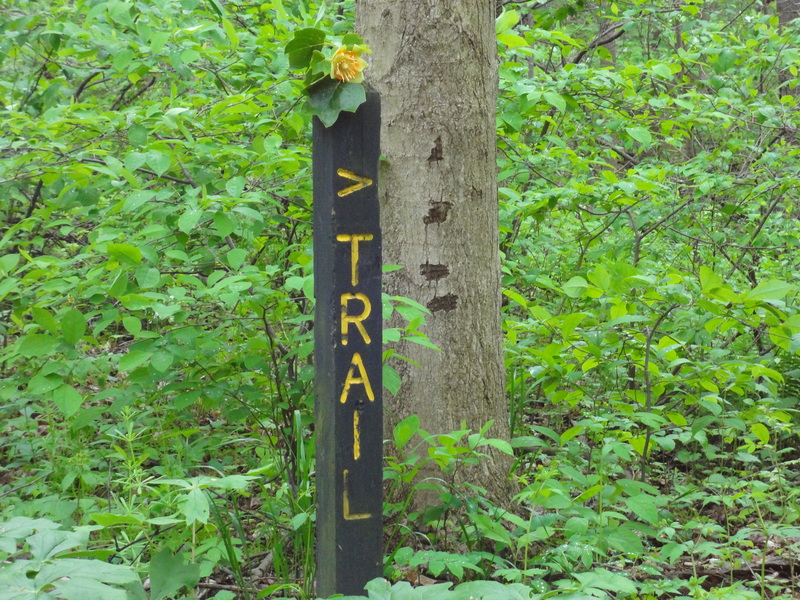 A cure for stress – not to mention a host of other ailments – might lie a simple walk. Recently a Women’s Health survey, “Health Benefits of Nature,” found that (women) who felt too stressed were more likely than non-frazzled women to spend a free day curled up on the couch. Worse, when stressed women actively try to relax: 54 percent plunk themselves in front of the TV, 44 percent eat, and 31 percent have a glass of wine; only 26 percent head out for a walk in the park. The “Health Benefits of Nature” survey, mentioned above also revealed that “Most women already understand that nature is good for health” and 73 percent wish they could spend more time outside. The surveys notes the mounting excuses as: Women are too intimidated by too-hot or too-cold weather (53 percent), too busy (44 percent), or too comfortable hanging out at home (22 percent). 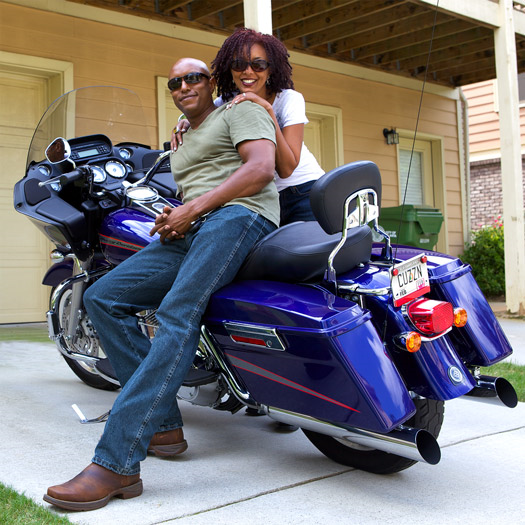 •Sit outside for 10 minutes a day – no excuses here! Even better, meditate outdoors for 10-20 minutes. •Schedule catch-ups around walks – Wine bars are so tempting. But for a fun change schedule dates and catch ups with friends around walks or activities outdoors. •Build it into your kids routine – at our house we have technology free time, we go on day hikes, fish, camp or swim in our nearby creek. Get out there and play with your kids too! Climb trees, get dirty, be a big kid. 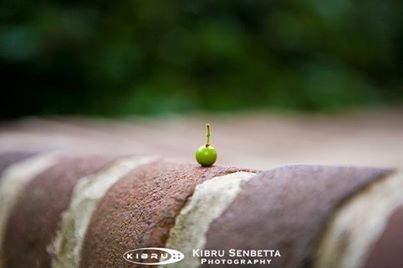 •Plant a garden – Whether it is in pots or in the ground get out there and get some plants growing. •Eat outside – Obviously this is easiest in summer but if you can cook a healthy homemade meal, light a few candles and create a romantic connection outdoors with your partner. A win-win! 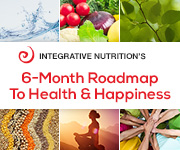 March 7, 2014 by Victoria Pardue Certified Integrative Health & Yoga Fit Instructor, posted in Institute for Integrative Nutrition, Natural Beauty/Self Care, Primary Food: Relationships,Physical Activity,Career,Spirituality, Recipes, To Your Health! Staying hydrated is essential to a happy and healthy body.Adding wholesome ingredients to your water is a fun way to ensure that you stay hydrated. 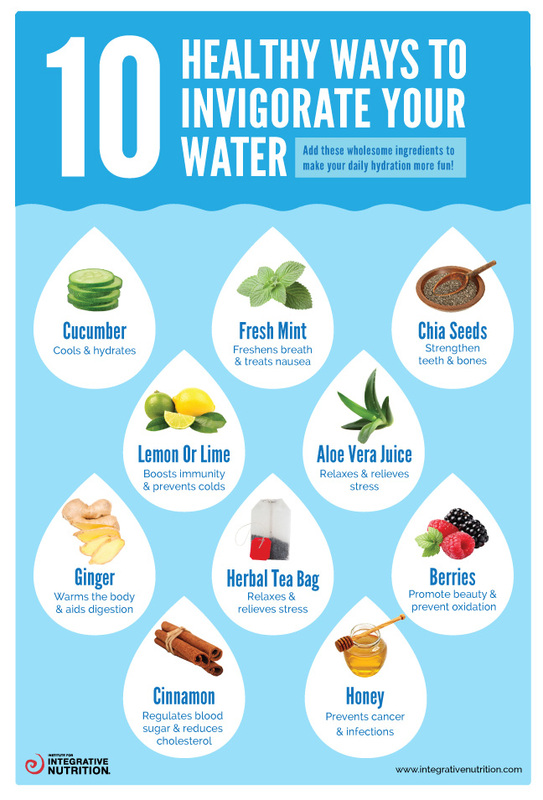 The Institute for Integrative Nutrition’s info-graphic (above) suggests easy ways to make hydration more fun with these wholesome infusions.